Chicago Area Mensa is a welcoming organization that provides a framework for intelligent individuals to interact and pursue common interests in order to build a social community. Mensans come from all walks of life. They range from three to one hundred years old. They represent both sexes, all races, various professions, and many beliefs. In fact, there's only one thing all Mensans have in common: high intelligence. To qualify for Mensa, you must have scored in the top 2% of the general population on a standardized intelligence test. There are many tests we accept. Once you've decided to join us, a world of social and intellectual opportunities is open to you. If our local events don't keep you busy enough, there are many other opportunities to meet other Mensans from all over the globe. Each October, Chicago Area Mensa hosts HalloweeM, one of the grandest of all the Regional Gatherings. In the summer, Mensans from around the country get together at the Annual Gathering, which is a feast of presentations and activities for our omnivorous minds. There are also Mensa colloquia: "The Evolution and Revolution of Manufacturing" was the most recent one held this last July. Past topics included "The Nature of Genetics," "Between Science Fiction and Science," "Crime Scene Intelligence," "Social and Video Games", "Electronic Gaming and Its Impact on Society," and "Weather." In a Twitter world, it's good to find some PBS minds. Come, see what we can do for you. Only 194 days until HalloweeM 44: May the Fours Be With You! Join over 500 Mensans here in Chicago for an amazing, long, family-friendly weekend. Our Regional Gathering (RG) is the largest and the program offers plenty of variety to stimuate your mind, plenty of games and contests to challenge you, and many opportunitys to have fun, dance, converse and just enjoy yourself. Many of the pun-tastic costume parade entries will make you laugh (or groan). Meals, snacks, and beverages are included with the exception of dinner on Saturday. Click/Tap here for all the details. Mensans, you can now register for HalloweeM 44: May the Fours Be With You! You don't want to miss this incredibly fun experience that runs from Thursday, October 31st through Sunday, November 3rd. The rates increase after May 4th. The hotel is offering a special $117 WeeM rate through October 10th, subject to availability. It's Halloween and you want to dress up and go to a party, of course. The stars have aligned this year and this is a fun opportunity to join the largest Halloween party by attending our RG Friday, November 1st . See great costumes, participate in the contest (best & worst pun, traditional, etc), enjoy a delicious meal, imbibe if you like, meet Mensans from all over the country (even some from across the oceans), and dance the night away. It's the perfect party! 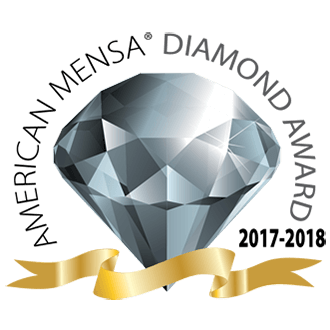 Chicago won the Diamond Jewel Award in 2018, 2016 and 2014, the Sapphire in 2017, and the Emerald Jewel Award in 2015. Chicago is also the only nine-time GOTYA (now replaced by the Jewel Award ) winner in Mensa. index.php last updated April 3, 2019.